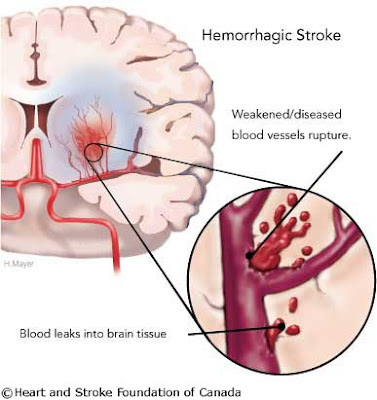 13% of stroke cases are hemorrhagic strokes. Hemorrhagic strokes happen when a blood vessel in the brain ruptures and bleeds into its surroundings. The blood then accumulates and compresses the surrounding tissues of the brain. There are two types of hemorrhagic strokes: intracerebral hemorrhage or subarachnoid hemorrhage. Intracerebral hemorrhage occurs when the blood from the burst vessel leaks inside the brain. A subarachnoid hemorrhage is when the bleeding is in the area between the brain and the thin tissues that cover the brain. There are two types of weakened blood vessels usually cause hemorrhagic stroke: aneurysms and arteriovenous malformations (AVMs). When a weakened area of a blood vessel starts to balloon, an aneurysm happens. If the aneurysm is left untreated, it will eventually rupture and bleed into the brain. An AVM on the other hand, is a group or cluster of abnormally formed blood vessels. These blood vessles can rupture and cause a hemorrhagic stroke. Magnesium sulphate is believed to improve the outcome of an aneurysmal subarachnoid hemorrhage. It does so by reducing the occurrence or improving the outcome of delayed cerebral ischaemia. This type of treatment has been debated as to its usefulness and effectiveness. An international randomised trial and meta-analysis published Online First in The Lancet should put an end to the debate about the use of intravenous magnesium sulphate to prevent poor outcomes after hemorrhagic stroke. The investigators found no benefit from magnesium treatment compared with placebo. "The findings from MASH 2 have important implications for clinical practice. Administration of magnesium is standard practice in many centres", explains Sanne Dorhout Mees* from University Medical Center Utrecht, Netherlands, who led the research. About a third of patients with aneurysmal subarachnoid hemorrhage (SAH; the bursting of a blood vessel on the surface of the brain), the deadliest form of stroke, will die within the first month. Of those that survive, 20% are left disabled. Delayed cerebral ischaemia can occur 4 to 10 days after SAH and is an important cause of poor outcome. The benefits of intravenous magnesium sulphate to limit the damage from SAH are controversial. Despite promising findings from earlier research, more recent studies have reported conflicting results. Here, the investigators report the results of a randomised trial comparing magnesium treatment (606 patients) with placebo (saline; 597 patients) in adults with SAH from the Netherlands, Scotland, and Chile. The main outcome measure was poor outcome defined as a score of 4 to 5 on the modified Rankin Scale (meaning severe disability), or death, 3 months after hemorrhage. No difference in poor outcome was recorded between the groups at 3 months—158 patients (26.2%) given magnesium compared with 151 (25.3%) given placebo had poor outcome. A further meta-analysis of seven randomised trials involving over 2000 patients with SAH found magnesium was not superior to placebo. The authors conclude: "Results from MASH 2 alone, and in combination with the other trial data, show that intravenous magnesium does not affect outcome after aneurysmal subarachnoid hemorrhage. Subgroup analyses did not identify a subgroup of patients who might benefit from magnesium treatment…therefore routine administration of magnesium cannot be recommended." In a linked Comment, Chethan Venkatasubba Rao and Jose Suarez from Baylor College of Medicine, Texas, USA remark: "The results, although disappointing, are nonetheless very pertinent to the management of patients with aneurysmal subarachnoid hemorrhage. We agree with the researchers, and previous findings, that routine intravenous magnesium sulphate infusion cannot be recommended for patients with aneurysmal subarachnoid hemorrhage."